In December, 128 students earned degrees from the Watson College of Education, including 74 enrolled in graduate-level programs. 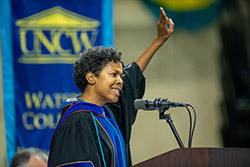 Candace Thompson was keynote speaker at the commencement ceremony for UNCW’s professional schools (Watson College of Education, Cameron School of Business and the College of Health and Human Services), held December 15 in Trask Coliseum. Thompson is chair of the Department of Instructional Technology, Foundations, and Secondary Education in the Watson College. View her inspirational address here. Faculty, graduates and their families celebrated at a reception in the atrium of the Education building the evening before official commencement ceremonies. More than 200 people attended the event, which featured hors d’oeuvres and beverages, and a photo booth for students and families. Dissertation title: Motivating Language Theory and Servant Leadership: Are These Tools for Effective Teacher Leadership? Please join us in congratulating all of our outstanding 2018 graduates! 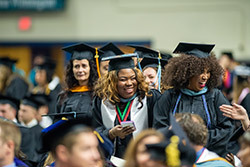 Visit the Our College Community section of the Watson Chronicle to see photos from WCE’s fall 2018 graduation celebration events and a special feature on Ed.D. graduate, Chris Gordon.